I got a call from a man in far northern Canada this week asking for permission to use some of my articles for a preparedness fair. We had a great visit but it got me to thinking about winter. I know for those of you in the northern hemisphere the timing for this is bad but for those in Australia and other points south now is the time to think winter. For the rest it’s always the right time to learn another self reliance tip. When my kids were living in North Carolina they experienced a week long power outage after an ice storm. They lived in a home without a fire place and they were poor students without much in the way of emergency supplies and definitely not much in the way of camping supplies. Those camping supplies are such a blessing. They ended up huddling together in one room trying to keep warm. They created a tent under a table and the two little ones slept in there. 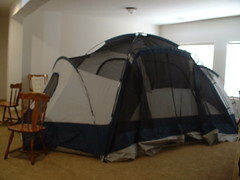 As part of your preparedness plan purchase a tent with an outer support frame. If you live in the city and have a large family you may consider purchasing more than one so they are a size that can be carried strapped to your back pack should you have to walk away from home. For those who are planning to shelter in place a larger tent is appropriate. Your tent should be, when possible, large enough to sit in and a best case scenario, large enough to place a chair in and still not hit your head on the ceiling. Tents are great for both summer and winter power outages. During a winter outage you can move a small table and some chairs inside the tent which you have set up in the room easiest to keep warm or the room with a fireplace. Place your tent a safe distance from the fire. You are now ready to have meals, play games and work on projects inside your tent. The tent will contain your body heat and you will be amazed at how warm you will be. At night simply take out the table and chairs and bring in the mattress, air mattress or sleeping bags and settle in for the night. During the summer your tent can be used to protect you as you sleep outdoors during an outage. If you get a great breeze through your home stay in your own bed but if you do not, place your tent in a location that will catch a breeze. If you are in the city, set up on your apartment building roof or your balcony, and you will be protected from mosquitoes and other bugs, mice, cats, etc. Open all the flaps and catch those breezes. If your disaster should make your home uninhabitable a tent can be used for camping in the yard while you protect your possessions. A tent can also be used to store items you have salvaged from your home, protecting them from rain damage and also from curious eyes. A tent is also a great way to create a potty area affording privacy as well as protection from the elements. Summer sales are beginning now on camping supplies and clearance sales are happening for those with winter approaching. Watch for a great sale and get a tent or two. Just a reminder, because of my concern for rising food prices, for the next two weeks I will send any new subscribers to the Totally Ready Newsletter a copy of our March issue which includes the information you will need to store a nutritionally balanced three month supply designed for your family’s needs, not the generic list you find other places.